The report, from an inspection carried out between November 2018 and January 2019, found that we were ‘Outstanding for caring’ in our inpatient services and ‘Outstanding for effectiveness’ in our community-based health services for older people. These latest ‘Outstanding’ service ratings add to those awarded in 2017 when our forensic inpatient wards were rated ‘Outstanding for responsiveness’ and our community services for adults with a learning disability received ‘Outstanding for caring’. Trust Chair Andy Trotter and Matthew Trainer, Chief Executive visited all the outstanding services in recognition of their achievement and to thank colleagues for their hard work. Matthew said: “This report is a great platform for us to build on. There’s a lot in there to be proud of and the CQC told us the things we need to focus on to become ‘Outstanding’ overall and when you look at the quality of care that we provide, that’s something we’ve got to push towards." CQC Inspectors found outstanding practice on our acute wards for working age adults and on our psychiatric intensive care units, including The Tarn. 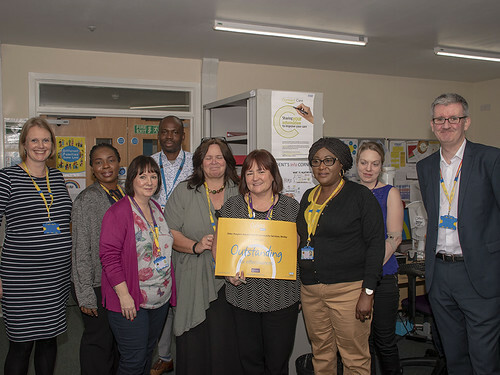 In our community-based health services for older people, inspectors were impressed by Greenwich Memory Service’s Quality Improvement programme to increase referrals for people from minority ethnic groups. Outstanding practice was also found on our wards for older people with mental health problems and our leadership team was found to be committed, with strong values and integrity. It was also found that we are committed to learning when things go well and also when they go wrong.